Happy Friday! Today's card uses one of new favorite sets, Engraved Greetings (p. 182, IBC). You might have missed it, since it's actually back in the accessories section. When I saw this set, I knew it was one that I would have to add to my first order from the new catalog. 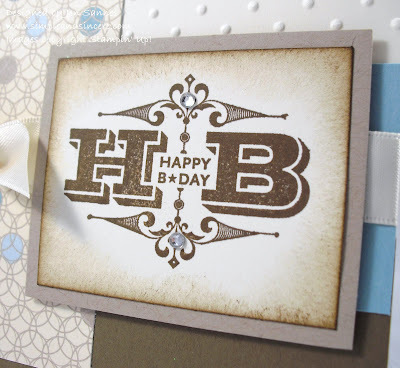 I love the letter press quality of the font, and it looks great on masculine cards. This is the card I provided as a make-n-take at our mini-convention earlier this week. The layout for this card was inspired by a project I saw on Dawn Olchefske's blog. Did you see that little bit o' sparkle? I added a couple of Basic Rhinestones to the main image, just to dress is all up a teensy bit. Great card! Love this color combo and that stamp set. I hadn't even noticed it in catalog...I've seen it twice today ;) TFS! I love your card! Perfect for either gender! 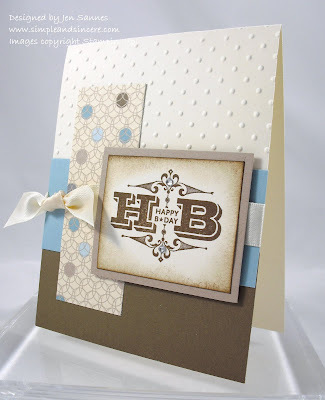 Love this card and the layout! Great way to use this stamp, too! Simple and clean with lots of style!